Welcome to the practice of Steven DeCasperis, DMD! Personalized treatment by gentle, caring professionals, advanced procedures, and exceptional results. These are just a few of the things that you can expect when you visit the office of Steven DeCasperis, DMD. 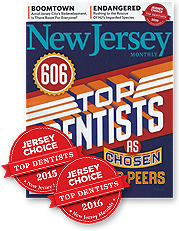 For more than 25 years, Dr. DeCasperis, Dr. Kendrick, and our caring team have been creating beautiful smiles for patients in Lebanon, NJ. Drs. DeCasperis and Kendrick are considered experts in all aspects of cosmetic dentistry, including teeth whitening, Invisalign® and Invisalign Teen® clear aligners, Lumineers® porcelain veneers, and dental implants. We have a state-of-the-art facility where we provide and have even introduced many advances such as laser dentistry, air abrasion (needle-free) fillings, and low-dose digital X-rays to patients in Lebanon, Flemington, and Bridgewater, NJ. Our office has been creating exquisite smiles for more than two decades, and we look forward to seeing you soon! Contact our Lebanon office today to schedule your free consultation! At Hunterdon County Dental Implant Center, we perform all aspects of dental implant treatment, including surgical bone modification and grafting, and surgical placement and restoration of dental implants. At Hunterdon County Facial Rejuvenation Center, we perform many aspects of cosmetic services including, Botox®, Juvéderm® XC and PRP Facial Rejuvenation.